We were all appalled to learn that we could have blood on our hands due to exploitation in the jewellery industry, which we’re more aware of thanks to the likes of Leonardo DiCaprio’s film, Blood Diamond, and the introduction of the Kimberley Process. 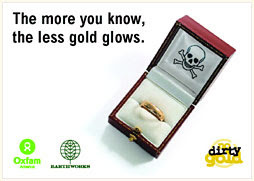 The next page in the ethical jewellery story looks like it could be a Fairtrade certified ‘Green Gold’ collection. The Fairtrade Foundation (FF) is working with the Association for Responsible Mining (ARM) and the ethical Chichester-based jeweller, Cred. Cred has formed a partnership with miners in a cooperative in Choco, an underdeveloped region in northeast Colombia, called the Green Gold (‘Oro Verde‘) project. The FF is exploring how to develop the concept of ethical gold with ARM, and hopes to be able to extent its successful labelling scheme to gold in the foreseeable future. ‘If we get a positive board decision to proceed with Fairtrade labelled gold, then depending on the outcome of the pilot studies to date, it would be likely that the first certified gold will be available during 2009,’ said Fairtrade Foundation policy and producer relations officer Chris Davis.